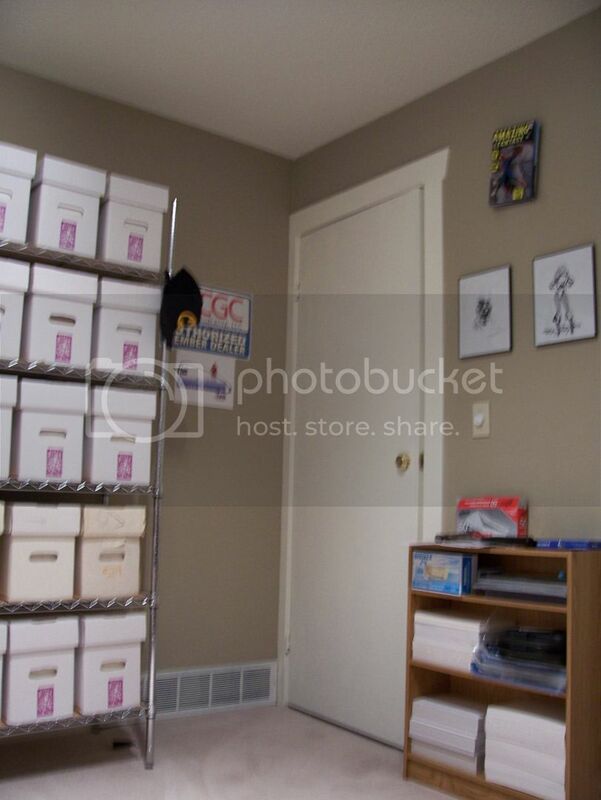 Got a comic room??? Showcase it here! Well, I moved earlier in the year and had to leave my old comic room behind. It was hard... until I started to make plans for the new one!!! This is my comic lounge... I call it "Johnny G's Spot"
Here we have the view from the doorway coming into the room. The framed portfolios on the wall are an autographed Writson Aparitions set and a few selected Starlin pieces. The 3 5x7's are some cool laser thingamajigs I purchased at last years ECCC. 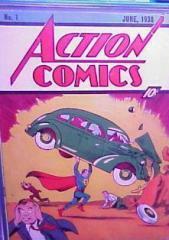 Next we have a shot of the comics themselves. There are multiple HC Books on artists as well as collected works. I have tons of other stuff to sort through and make adjustments where needed. This is my "lounge" the bulk of my books are in 2 5x10 storage lockers locked up tight! I also have an "overflow" room downstairs.... ahhhh the joys of being single again! Here we have a view from my reading position. The 2 sketches are Neal Adams' Black Canary and Deadman. I recently purchased the AF15 3-d cover (quite cool). Lastly, the closet... if I showed you what was in it, I'd have to snuff you out!!! 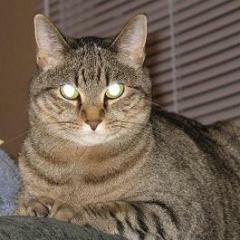 I've got Tony Montana watching over things up above it... "So, you wanna play rough eh? OK... just not in here"
And that folks is my little piece of heaven I am debating hanging McFarlane figures around the ceiling.... I think it may be overkill. I have 2 great Frazetta pieces that are currently being framed... they are going into the guest/overflow room. My good friend CrowsQB (boardie) will be the first to hang with me in it tomorrow. We plan on having a comic themed movie day I am sure he is also planning on harassing me to sell some books to him! Do you have a set-up? Show us what you've got! I know there have beem threads on this in the past... but who cares! I think we have all heard enough about CA #25... if there can be 20 threads on that, why not a few on this? I am trying to catalog everything I have. If I keep it to the 50 or so boxes in the room, it seems more manageable. Once I go through 5 boxes, they go to storage and 5 more come out. Well, that's been the plan anyways... sometimes I get lost in the nostalgia and nothing gets done! C'mon... no-one else gonna show us your stash? Sweet room Johnny G and I need a set up like that one day. It looks good now (clean). Trying to keep it that way is a different story! I have a bad back and wanted a system where I didn't need to lug boxes around... this does the job perfectly The shelving is super strong and collapses easily. I believe that it can also be added to (extra height). I know there are others out there with some pretty sweet set-ups, maybe some will post over the weekend. 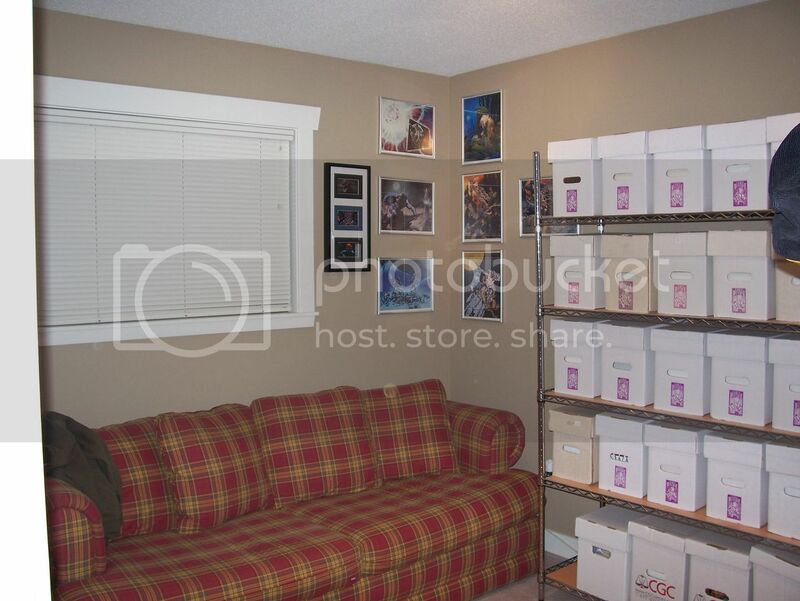 Man that couch with all those comic books around it for me would be like the most expensive bed in the most expensive hotel in the world. You should start charging for it JG! 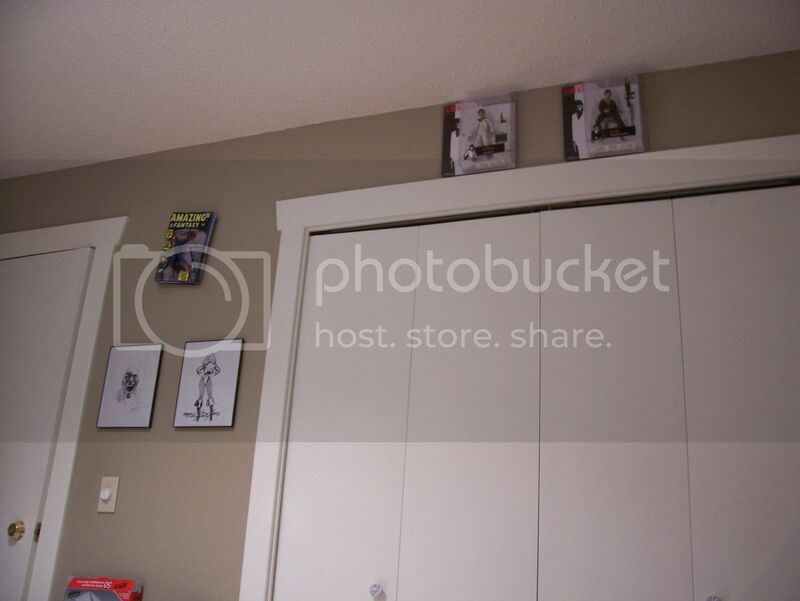 Sweet comic room, Johnny G.
Love it! I'd like to do something up but I have a small house and a roommate. Most of my stuff is secure in a closet. I do have some framed posters though, right now Superman and Joker/Harley Quinn (both Alex Ross) are in my living room . Johnny G: Where did you get those shelves? Home Depot? They look familiar. Looks like short boxes fit perfectly on them. Nice set-up! Nice rooms I don't have nearly enough books to even dedicate a shelf to them but with time. Love the TV over the fireplace! I got the shelves at Lowes... under $80ea and they fit 25 shorts perfectly! I do recommend getting a wood panel and having it cut to fit the shelves. They are "rods" so they can dig in to the boxes and perhaps books. It also makes it much easier to "slide" a box out. I just bought 2 Maple panels (matched desk in previous room) and had them cut right at the store... tack on another $30 or so. It's funny to see how people think differently. I've used similar shelves from Metro (before less expensive versions became available) for about 12 years and now buy mine from Target. 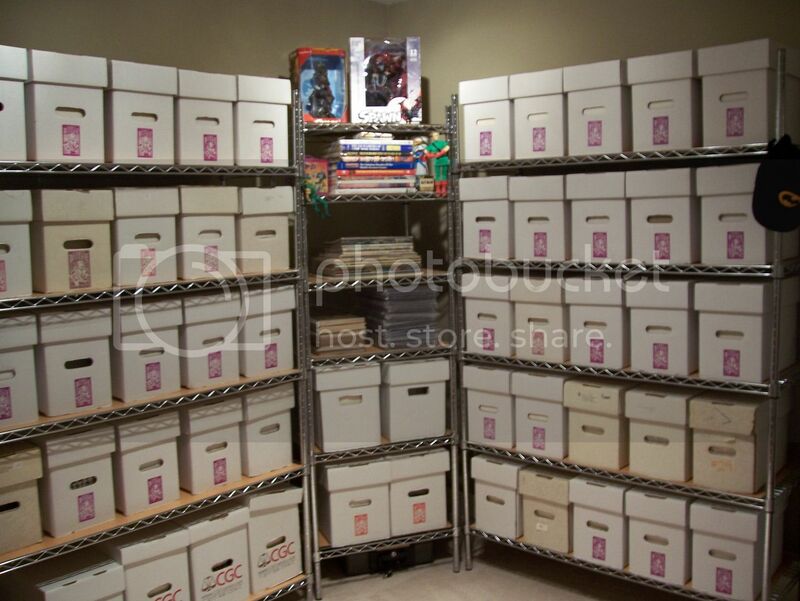 I actually like the rod set-up on the shelves and haven't put boards underneath the boxes. In my mind, it allows air circulation, prevents micro-environments from forming and discourages insect activity. I definitely see your point, though--I know I'm careful when I slide out a box. Also, I typically pick the black finish, which is, I believe, epoxy, with less off-gassing danger. I'm sure I've overthought this. Duffman does not approve! Oh Yeah!